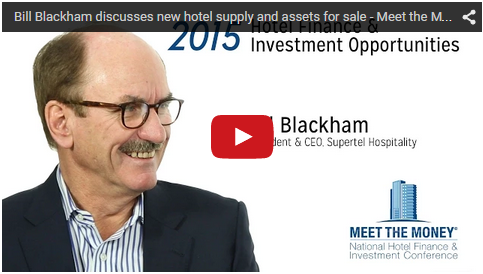 Bill Blackham, President and CEO of Supertel Hospitality, speaks in the video below about new supply and assets coming to the marketplace for sale, changing guest expectations across different segments, and financing for new development. 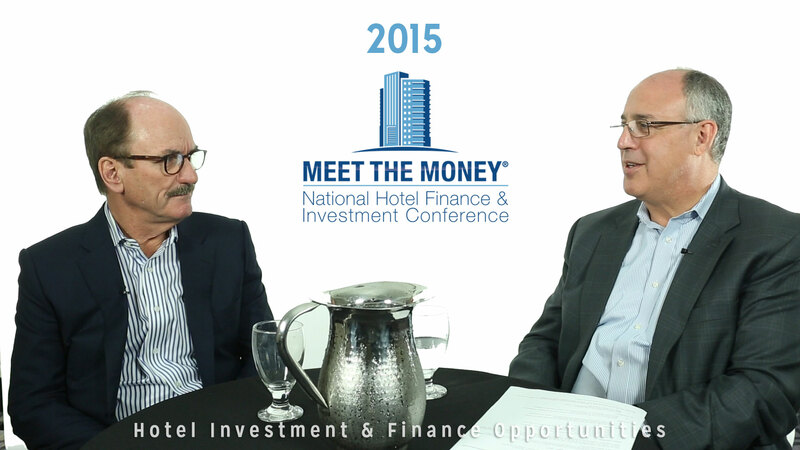 Bill spoke with Bob Braun, a senior partner in the JMBM Global Hospitality Group®, as part of our video interview series on hotel finance and investment opportunities in 2015. Bob Braun: I’m Bob Braun, I am a partner at Jeffer, Mangels Butler and Mitchell. I’m part of the Global Hospitality Group®. I’m here at Meet the Money® 2015 for our 25th Anniversary, and I’m talking with Bill Blackham, who is the President and CEO of Supertel Hospitality. Bill, it’s good to have you here. Bill Blackham: Thank you Bob, it’s nice to see you again. Bob Braun: Bill, I wanted to start out just to ask you–you’re in a very special position. What kind of opportunities are you seeing in the hospitality market these days? Bill Blackham: Well, there are opportunities in all different spaces and different markets, so obviously in various chain scales. I think I would address it with those areas that we focus on because I’m not as attached to the other areas. At this juncture, we are seeing a lot of assets coming to the marketplace for sale. There are groups of sellers that are seeing that they are more buyers, and so therefore they are trying harvest or monetize their assets. And obviously, at the extreme ends in the urban marketplaces, pricing has gotten very frothy. The opportunities that we are addressing are, say, in the 10th through the 50th MSAs and in the upper mid-scale and upscale chain scales with brands that everybody is familiar with. There are still good pricing dynamics in those assets, in those hotels, with some upsides that still remains. There’re good occupancies, there are good demand generators, overbuilding has not really occurred in a lot of the markets that we’re taking a look at. So there’s a good confluence of factors going on right now. How long it lasts is anybody’s guess. Bob Braun: It’s always the question. So you answered one of the questions I was thinking of. You said that you weren’t seeing a lot of new supply coming into those markets. Is that one of the reasons you’re more interested in that 50-100 MSA? Bill Blackham: No, obviously new supply is going to be a function of so many variables, as with any form of real estate. Hotels in some respects are no different. You have to take a look at each geographic location individually, and then take a look at the demand generators and the supply, and the quality of the existing supply. But once you get through all of those on a case-by-case basis, financing for new development is still not as beneficial or as generous as it has been in past cycles. There’s still larger amounts of equity that are required and put some constraints on it. While values have certainly risen quickly, it’s not until you see significant pricing beyond replacement costs, where you get a large inducement and demand and/or in development. I think we’re there yet in the particular markets that we’re looking at. Another thing I look for very carefully–there has been such an expansion of the distribution in the brands that I’m interested in being involved, in that there are not a lot of unfilled brand opportunities in those markets, and so the new development will only take place when an aging hotel is kicked out of the system, and so that forms a natural constraint on development as well. Bob Braun: I was wondering when you talk about brands, last week we got the notice that Starwood is thinking of its strategic alternatives. I use to do take over work and that means they’re putting a “For Sale” sign–among other things, a “For Buying” sign. Does that play into your plans at all? Does that make you rethink what the playing field is going to be like? Bill Blackham: Well, certainly there has been a lot of speculation as to what will eventually occur and not occur with Starwood and who might be the buyer, or whether or not some of the brands may be split up. But at the end of the day, the ownership of the brand is probably less of an issue in what I’m looking at. You still have to go back to: how healthy is that brand with the customers in the marketplace? What I would say to you is that is they have some brands inside the company that are highly followed and highly regarded. And so, therefore, what they’re doing would not affect my decision to make an investment. Bob Braun: That’s great. Another question. So you’re focusing on the upper- and mid-scale or upper-mid-scale on the upscale. What do you think are the changes in what hotel guests are looking for? You think they’re driving toward that particular market? What are some of the things that have changed in terms of guest expectations? Bill Blackham: Well, it may not be a change in just guest expectations. There is a shifting going on that’s very perceptible in that less of the hotel guests themselves need the full complement of full service; something approaching full-service, like a select service, has enough ingredients to satisfy their requirements. It becomes a value proposition for them. I guess I have to qualify that and say clearly that in big cities, full service hotels have a tremendous following. Select service is doing quite well in the larger cities. But as soon as you get out of the larger urban areas and get into the peripheries and the suburbs, prices and quality are very big drivers for demand, and for the customer. It just seems that that upper-mid-scale space and the up-scale space have the price value proposition that the larger customer base is looking for, particularly with the generations beyond the baby boomers. Bob Braun: Yeah, it would seem that that the select service fills that niche between the limited service, which perhaps doesn’t have quite the amenities or quality that people want; but they don’t necessarily need the room service and they don’t need the sundry shop. They don’t need the full three-meal restaurant. But they do want the same quality as something a little upper-scale. Bill Blackham: And in particular, I’ve noticed this with customers that are in the 25-40 year old age bracket. Because they want all of the connections or the connectivity, and yet have some kind of a space where they can sit and, frankly, grab something very quickly for breakfast, and have the laptop open at that time, and get out the door. That’s the product that they’re looking for, and so that type of shifting in preference has been evolving for over ten years. Now as the customer base is shifting because of age, there seems to be an acceleration of that. It’s not just something we’re noticing. Everybody’s noticing it. Bob Braun: Well, I noticed that, the first thing I do when I go to a room now is count the number of outlets, and I make a value judgment if they have USB outlets. Bob Braun: Because who really needs a plug anymore? I need a USB. Everything goes by USB now. I’m going to ask one last question which is coming up a lot–I see it a lot in my clients, and in their decision making. How much has low interests rates and just persistently low interests rates made a difference in your execution, your strategies, and do you think that that’s something you can count on in the future? Bob Braun: You’d rather bet on the Super Bowl? Bill Blackham: Or something. The World Cup… But no, I think that the industry–not just our industry, many industries–have benefited from um an extraordinarily low cost of capital. And what it has done is drive very attractive equity returns that are more financial in nature, driven by financing, as opposed to strong economics. Now, obviously in the last two years that has changed in hospitality, because it has come roaring back, but as it came roaring back, interest rates stayed less expensive and therefore returns are perhaps are artificially high in relationship to…let’s just call it “normality.” So as interest rates rise, that will affect returns. But certainly, if you stop to take a look at, for example, Supertel. If we go out and look to buy a hotel today–as inexpensive as fixed-rate, long-term financing is—rather than doing that, we’re probably more inclined to take a LIBOR-based floating rate loan, say 65% or 70% of the purchase price. Use that as a warehousing facility, get tremendous equity–returns notwithstanding–what the cap rate may be going in, and then be able to pay that loan off with an equity raise at some point in the future. So the flexibility part of that is very attractive too. Bob Braun: Ah well, Bill, glad you took the time to chat with us. Really appreciate and look forward to the rest of the conference. Bill Blackham: My pleasure. Thank you. Bob Braun: Thanks very much.